* The veins on the back of the hand and at the front of the elbow. Those at the elbow are often used for drawing blood for test purposes, as well as for intravenous injections. The largest of this group of veins are the cephalic, the basilic, and the median cubital veins. * The saphenous veins of the lower extremities, which are the body’s longest veins. The great saphenous vein begins in the foot and extends up the medial side of the leg, the knee, and the thigh. It finally empties into the femoral vein near the groin. Figure 11-8 Principal systemic veins. Two large veins receive blood from the systemic vessels and empty directly into the heart’s right atrium. The veins of the head, neck, upper extremities, and chest all drain into the superior vena cava. This vessel is formed by the union of the right and left brachiocephalic veins, which drain the head, neck, and upper extremities. The unpaired azygos vein drains the veins of the chest wall and empties into the superior vena cava just before the latter empties into the heart (see Fig. 11-8) (azygous is from a Greek word meaning “unpaired”). * The right and left veins that drain paired parts and organs. 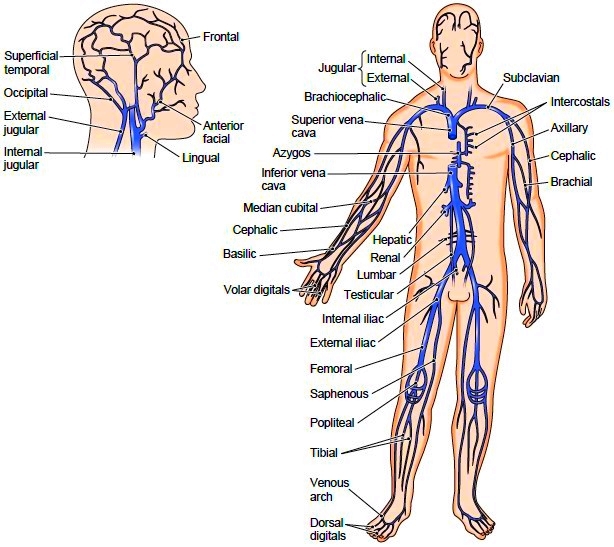 They include the iliac veins from near the groin, four pairs of lumbar veins from the dorsal part of the trunk and from the spinal cord, the testicular veins from the male testes and the ovarian veins from the female ovaries, the renal and suprarenal veins from the kidneys and adrenal glands near the kidneys, and finally the large hepatic veins from the liver. For the most part, these vessels empty directly into the inferior vena cava. The left testicular in the male and the left ovarian in the female empty into the left renal vein, which then takes this blood to the inferior vena cava; these veins thus constitute exceptions to the rule that the paired veins empty directly into the vena cava. * Unpaired veins that come from the spleen and parts of the digestive tract (stomach and intestine) empty into a vein called the hepatic portal vein. Unlike other lower veins, which empty into the inferior vena cava, the hepatic portal vein is part of a special system that enables blood to circulate through the liver before returning to the heart. * The two cavernous sinuses, situated behind the eyeballs, drain the eyes’ ophthalmic veins. They give rise to the petrosal sinuses, which drain into the jugular veins. * The superior sagittal sinus is a single long space located in the midline above the brain and in the fissure between the cerebrum’s two hemispheres. It ends in an enlargement called the confluence of sinuses. mater (the outermost membrane around the brain). They begin posteriorly from the confluence of sinuses and then extend laterally. As each sinus extends around the skull’s interior, it receives additional blood, including blood draining through the inferior sagittal sinus and straight sinus. Nearly all of the blood leaving the brain eventually empties into one of the transverse sinuses. Each sinus extends anteriorly to empty into an internal jugular vein, which then passes through a hole in the skull to continue downward in the neck. 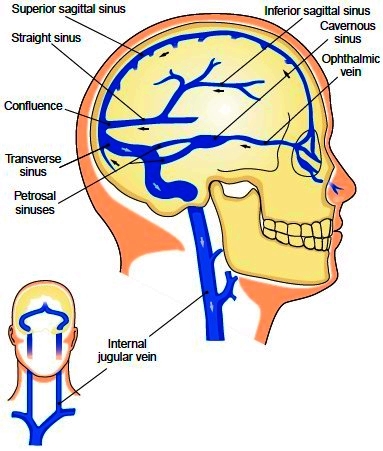 Figure 11-9 Cranial venous sinuses. The inset shows the paired transverse sinuses, which carry blood from the brain to the jugular veins. Figure 10-8 Blood vessels that supply the myocardium. 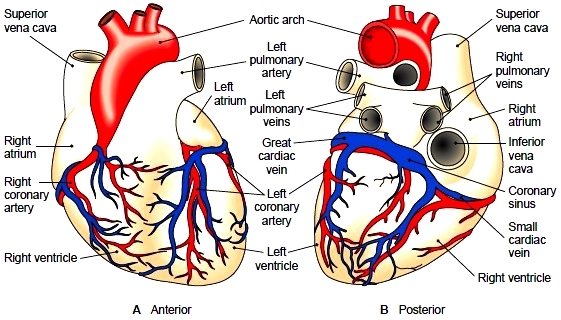 Coronary arteries and cardiac veins are shown. (A) Anterior view. (B) Posterior view. Almost always, when blood leaves a capillary bed, it flows directly back to the heart. In a portal system, however, blood circulates through a second capillary bed, usually in a second organ, before it returns to the heart. A portal system is a kind of detour in the pathway of venous return that transports materials directly from one organ to another. A much larger portal system is the hepatic portal system, which carries blood from the abdominal organs to the liver (Fig. 11-10). The hepatic portal system includes the veins that drain blood from capillaries in the spleen, stomach, pancreas, and intestine. Instead of emptying their blood directly into the inferior vena cava, they deliver it through the hepatic portal vein to the liver. The portal vein’s largest tributary is the superior mesenteric vein, which drains blood from the proximal portion of the intestine. It is joined by the splenic vein just under the liver. 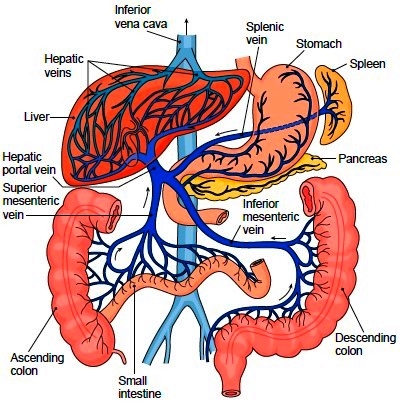 Other tributaries of the portal circulation are the gastric, pancreatic, and inferior mesenteric veins. As it enters the liver, the portal vein divides and subdivides into ever smaller branches. Eventually, the portal blood flows into a vast network of sinuslike vessels called sinusoids. These enlarged capillary channels allow liver cells close contact with the blood coming from the abdominal organs. (Similar blood channels are found in the spleen and endocrine glands, including the thyroid and adrenals.) After leaving the sinusoids, blood is finally collected by the hepatic veins, which empty into the inferior vena cava. The purpose of the hepatic portal system is to transport blood from the digestive organs and the spleen to the liver sinusoids, so that the liver cells can carry out their functions. For example, when food is digested, most of the end products are absorbed from the small intestine into the bloodstream and transported to the liver by the portal system. In the liver, these nutrients are processed, stored, and released as needed into the general circulation. Figure 11-10 Hepatic portal system. Veins from the abdominal organs carry blood to the hepatic portal vein leading to the liver. Arrows show the direction of blood flow.